Our tech support guys work hard to make our customers happy, and the calendar function is frequently cited as the ‘most amazing’ tip they can give. Of course, no one calls us because of the calendar. They mostly call us because the PM’s they thought they set up are doing something unanticipated or event scheduler did something wonky. Or maybe something else altogether, but they do need help. Our techs listen to the issue and make a few suggestions and if that doesn’t work, everybody gets on TeamConnect. This allows our customers to have a tech fix their issue remotely, and is quite handy. And really a step up from ‘make sure your computer is running TeamWORKS’ or ‘can you exit TeamWORKS and log in again?’. TeamConnect allows the customer to give TeamWORKS techs control so they can troubleshoot more easily. Work orders and all that go with them (PM’s, event scheduler, fuel tracker, inventory and all the rest) frequently use a calendar option. No surprise there – you have to know when the work is needed. But it’s so much easier to choose a date instead of typing the date in. 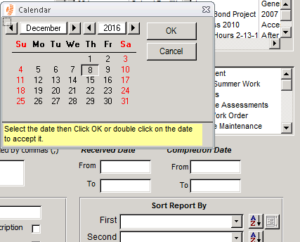 Even though the text in yellow states that a user can double-click on the date to accept is as the date for the field, our users are frequently amazed that this option exists. And it really is the easiest option to add a date in TeamWORKS. Our techs frequently use it as a shortcut and of course use it when they are working on TeamConnect because it’s a habit. Hope that tip helps! If you have questions about how TeamWORKS will help make your maintenance life easier and are a customer, give us a call. We’ll help you discover things in TeamWORKS designed to make your life easier so you can spend more time doing other stuff.